A dear friend of mine who has been in remission for many years recently learned she has cancer again. It hurts my heart so. As a friend, what can I do? 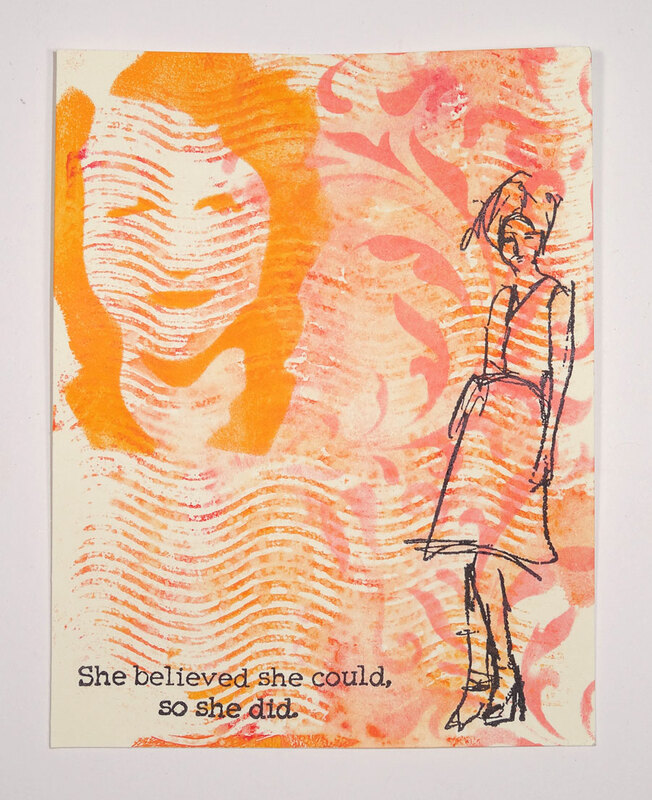 I remember she told me once how she loved getting cards during the most difficult times so I created a special, artsy card this morning using only paints, inks, stamps and stencils. No flowers, no ribbon, just art. I hope it brightens her day just a little. Let me share how I made it. A complete product list is at the end of the post. My finished card measures 4 3/4" x 6". 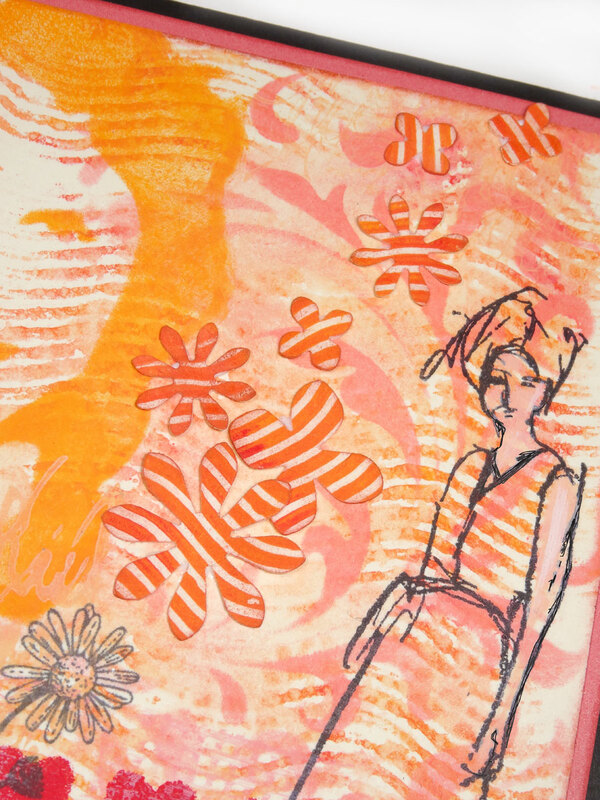 Begin by squeezing a few colors onto a Gelli Plate. 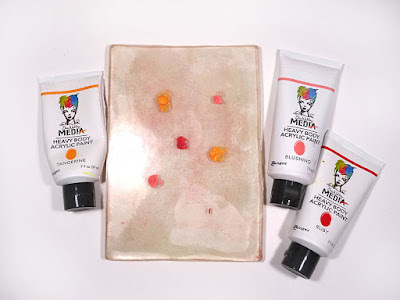 I love Dina Wakley Media heavy-body acrylic paints. 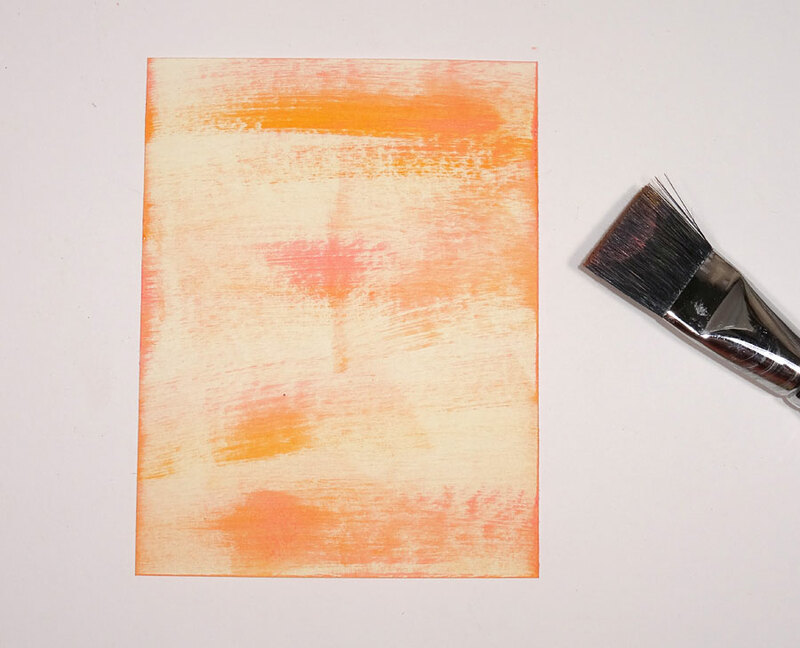 Spread the colors with a brayer just enough to blend, not mix completely, then use a painter's comb like this, or any other texture tool to make a pattern in the paint. Cut a 4 1/4" x 5 1/2" piece of Mixed Media Cardstock and press one into the Gelli Plate (left photo). If you're happy, stop. I wanted a lighter, more artsy look, so I spritzed the Gelli Plate with water and pressed a second piece of cardstock into it. (right photo) This is better! Squeeze paint onto a non-stick craft sheet and use a blending foam tool to lightly pick up some color. 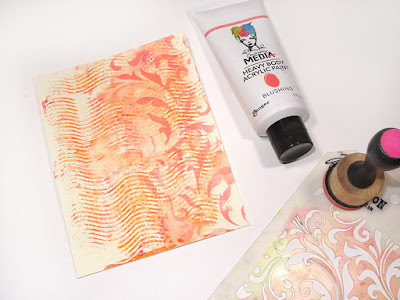 Gently blend the color through a stencil along the right edge of the cardstock. I used Stampers Anonymous Flourish stencil. Repeat with another color and stencil in the upper left corner. 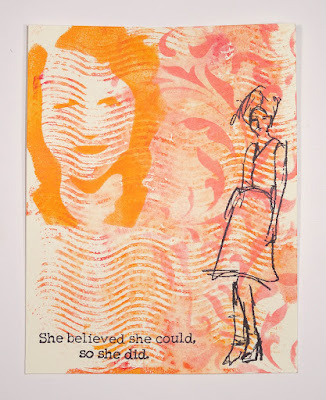 I used Dina Wakley's Four Women stencil. 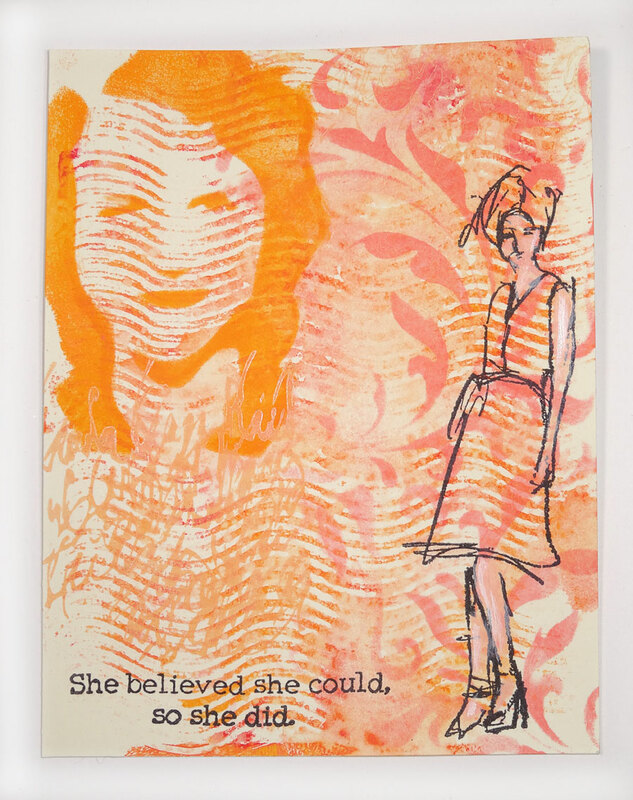 Stamp an image and sentiment with Jet Black Archival ink. This fun stamp is from Dina's Fashion Forward set. I found this at my local Hobby Lobby! If desired, paint in the girl. I painted only her skin because I liked the texture and color behind her clothes. 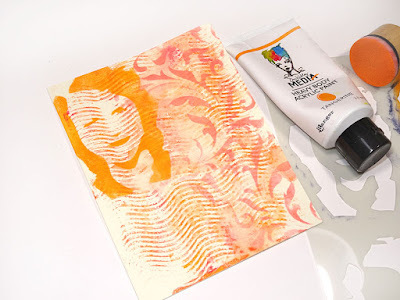 I had some leftover paint on my craft sheet so I brushed some onto a stamp from Dina's Texture set and stamped it below the face. On another piece of cardstock I brushed dry strokes of the paint colors left over on my craft sheet. This will be for the inside of my card. Stencil some hearts with a bold color. I did this on the inside as well. 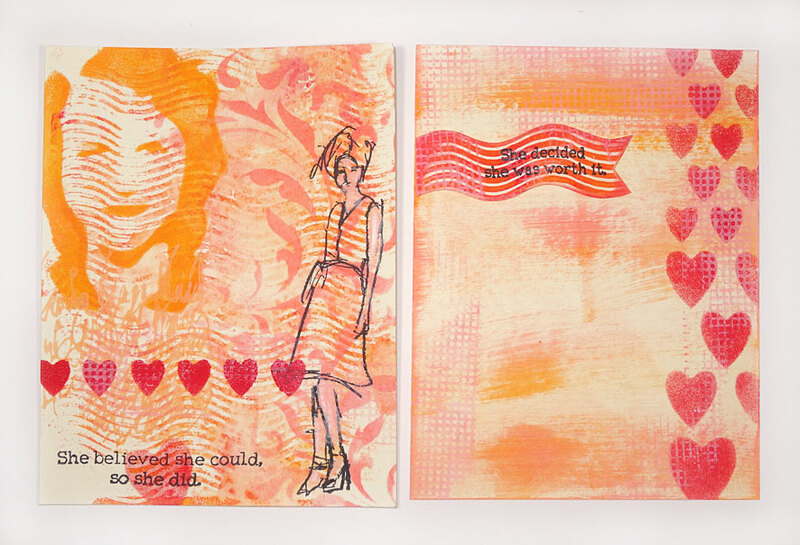 Also, I cut a wavy piece from my original Gelli print for the sentiment inside. Nothing goes to waste! Stamp images in the lower left corner, if desired, and inside your card. I used Watering Can Archival ink for my flowers. These are from Stampers Anonymous new Flower Jar set. 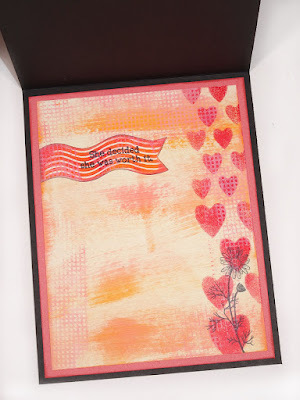 I also layered some pale pink stamping from the Textures stamp set in various areas. 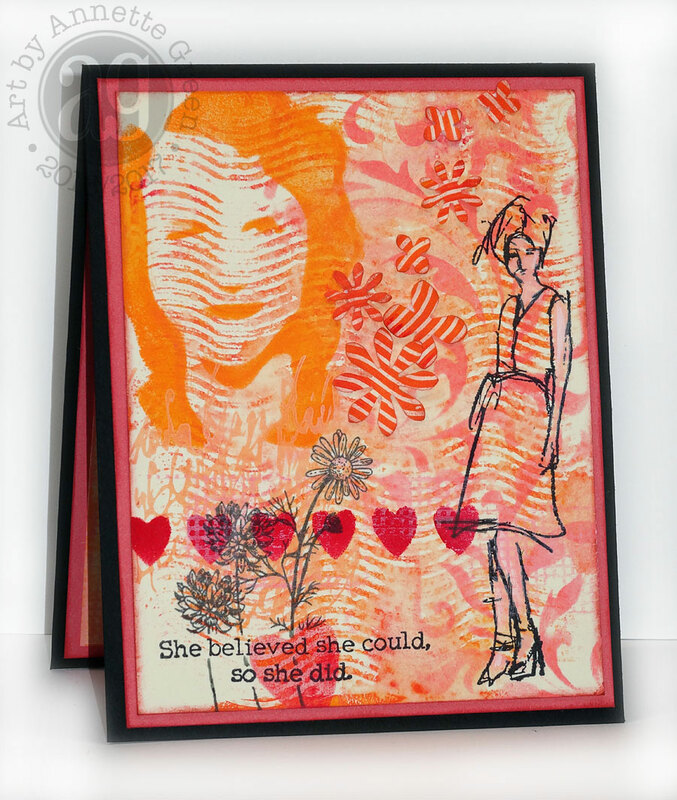 The middle of my card seemed a little empty so I punched some flowers out of the original Gelli print and adhered them flat. I also went over the stamped lady with my Fude Ball pen where I had painted over those lines earlier. I mounted both the front and the inside pieces to a compatible pink cardstock (Smoothie, from Close To My Heart) then adhered that unit to a black card. 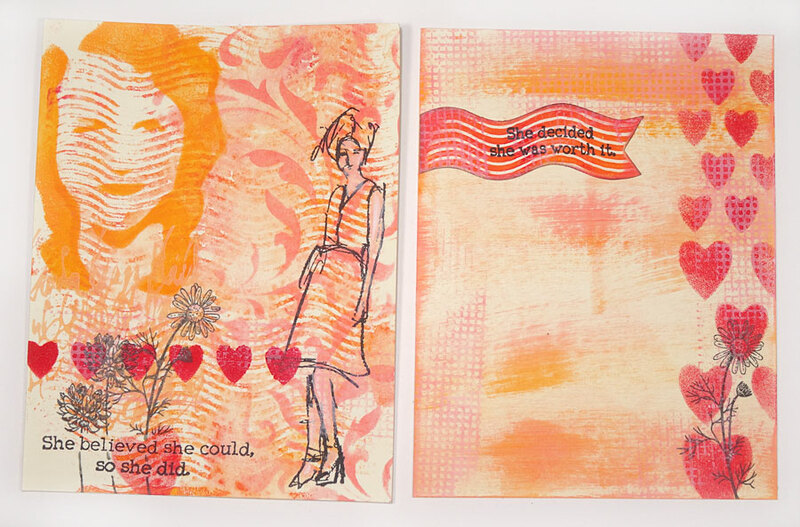 Here's the finished card once again. Now I'm off to make an envelope and pop this in the mail. Thanks for stopping in today. I hope you have a fabulous day! The holiday of St. Patrick's Day is a funny one. I want to celebrate it, but I'm only a tiny bit Irish so it doesn't really hold a lot of meaning for me. 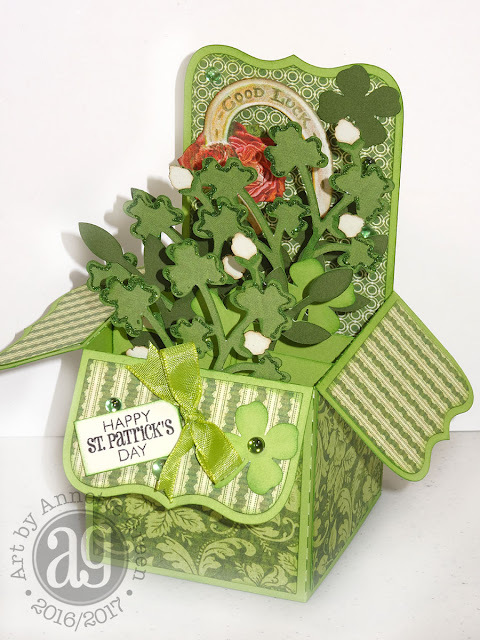 Rather than "celebrate" it, I enjoy making St. Patrick's Day cards for my Irish friends. 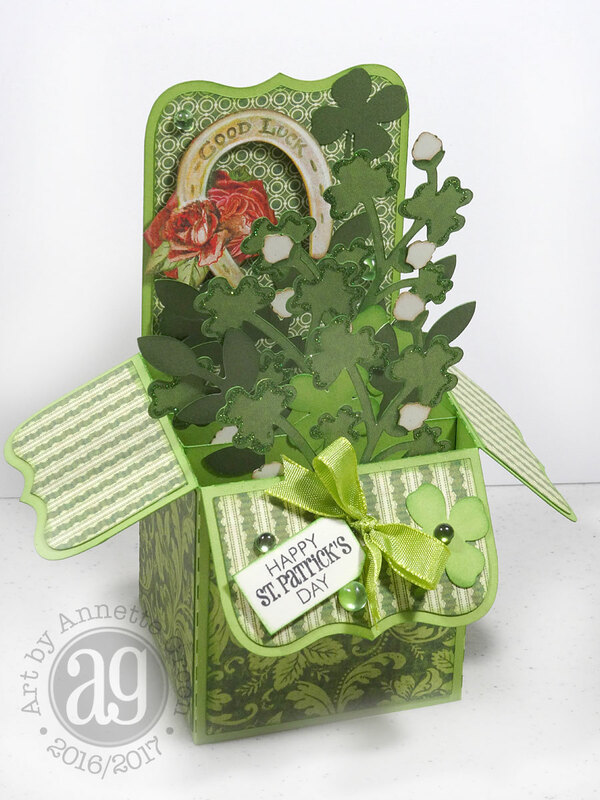 And although the box card craze is probably passé by now, I still enjoy making them from time to time. Today I'm sharing a quick tutorial on how I made my St. Patrick's Day box card. My box card started with Graphic 45's "Off To The Races" papers, both the Patterns & Solids, and the 12" x 12" paper pad plus one sheet of bright green cardstock. 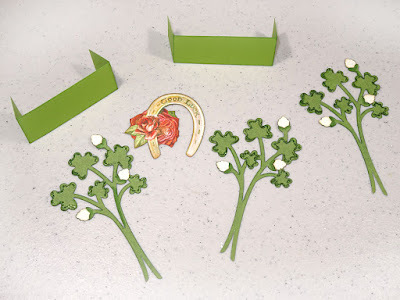 I've used an SVGCuts file for my cutting from their Box Cards Kit, but you can make box cards easily with a trimmer and scoring stylus. 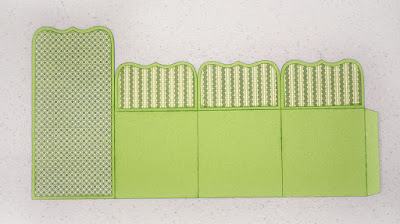 You won't get those cute bracket cuts on the flaps, but it'll still be pretty in the end. Simply cut your cardstock base 11 3/8" x 5 3/4". Score vertically at every 2 3/4" until you have 3/8" left over. Turn the piece a quarter turn and score one long score at 2 7/8" all the way down. Cut away 1 1/8" from the tops of three of the flaps and make a slit between each until you get to the score line. If you're using the SVG file, the paper pieces are all included. 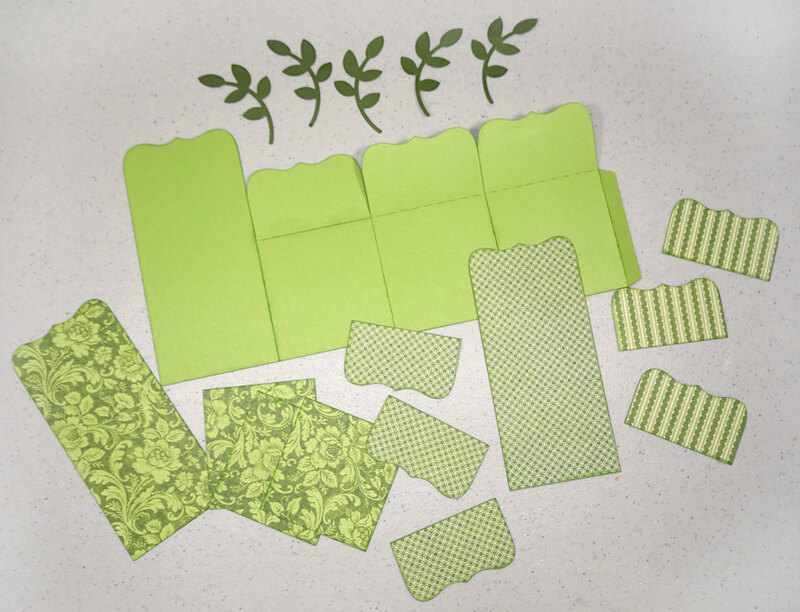 Simply choose the papers you want and send them through your cutting machine. 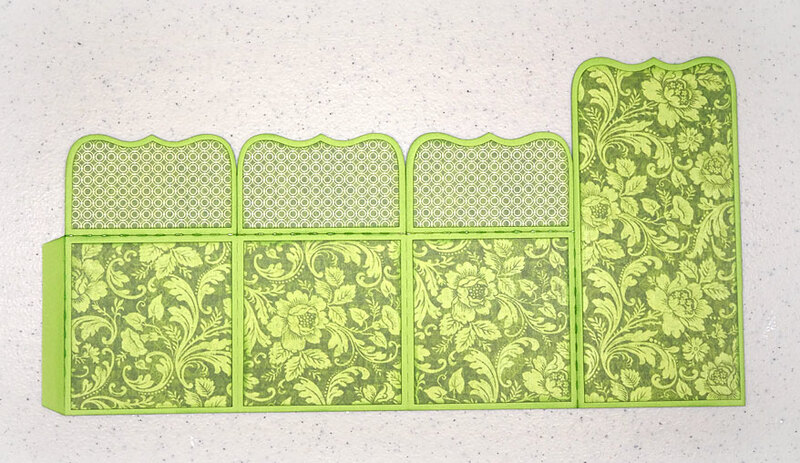 I use the Cricut Explore and always use the German Carbide blade for the cleanest cut. If you're cutting your own papers, cut three at 2 1/2" x 2 5/8", three at 2 1/2" x 1 1/2" for the flaps, and one tall one at 2 1/2" x 5 1/2". Adhere these to the base as shown. This will be the outside of your box and the flaps will fold down. Flip the whole thing over and cut more papers for the inside of the box. I didn't cut any of the squares on mine, but you could. 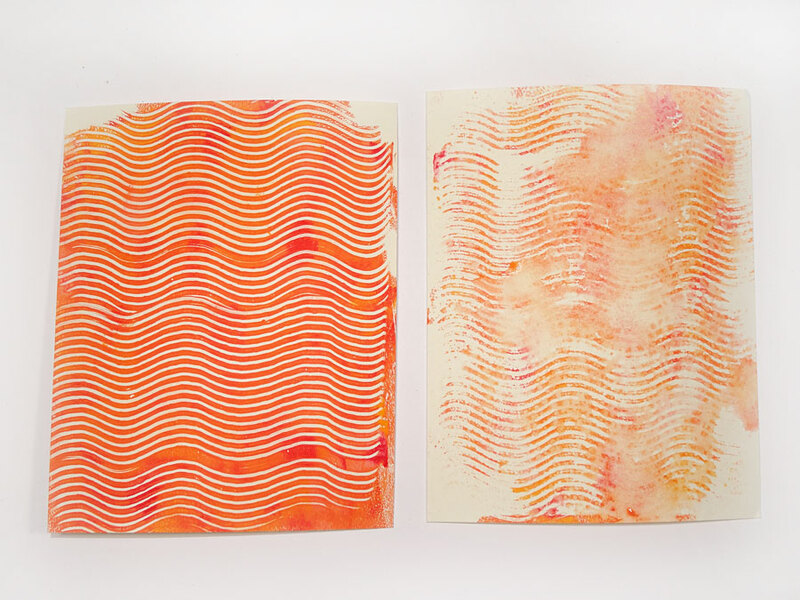 The two inner supports are also included in the SVG file, but if you're cutting your own, simply cut two cardstock strips at 4 1/2" x 1" then score 7/8" from each end. 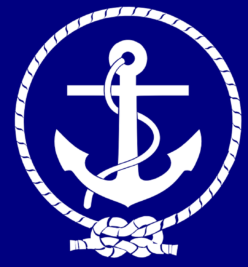 Fold inward as shown. The SVG file I used had flowers, but I wanted clovers, so I searched and found that I owned these clover clusters in my purchased images. They came from Close To My Heart's newest cartridge called "Flower Market." I cut three and assembled them. 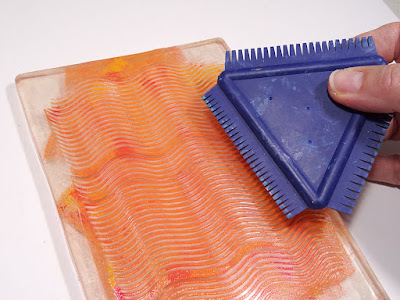 Now is also the time to do any fussy cuts or added elements. You'll see that I punched some additional clovers to fill in spaces later. 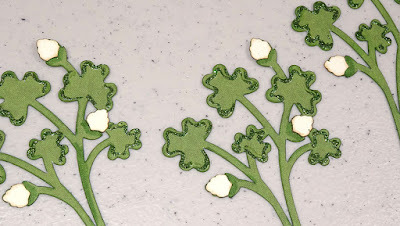 I added a quick tracing of green silk microfine glitter from Elizabeth Craft Designs around my clovers. I used a green marker for shading and I inked the edges of the white buds with Vintage Photo Distress Ink. Now it's time to assemble the box. See that green tab on the inside? You won't see that once you fill in all the stuff later, but if this bothers you you could always adhere that large paper over the top of it after you've assembled, rather than beforehand like I did. After you've adhered some elements to the back wall of the box, you can add those "supports" to the inside. I found it easier to adhere the supports separately, then add the "filler" elements to those supports afterwards so I could see where things needed to stagger. But you may prefer to adhere them to the supports first. Up to you. Keep layering elements and checking the fullness until you're happy. The four-leaf clover punch I used is from Martha Stewart Crafts. (I just checked and looks like this punch is rather old and therefore rare. Saw it on eBay for as much as $88! So use whatever you have available to you.) 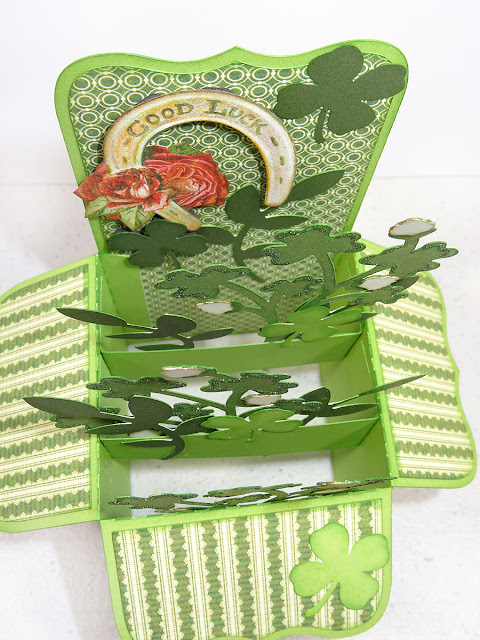 To finish up, I stamped a sentiment, added some ribbon and then some green gems. 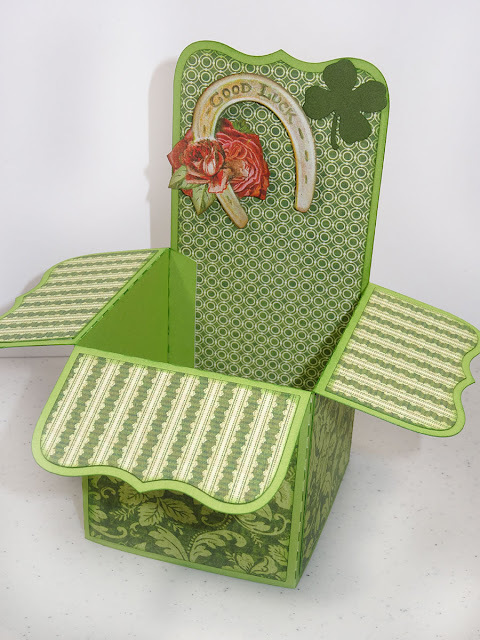 The best part about this box card is it folds FLAT and can be mailed! I gave this one to my parents yesterday, as they treated us to a delicious Irish meal of Corned Beef and Cabbage. I loved the look on their faces when they popped open the card and it turned into this pretty box! 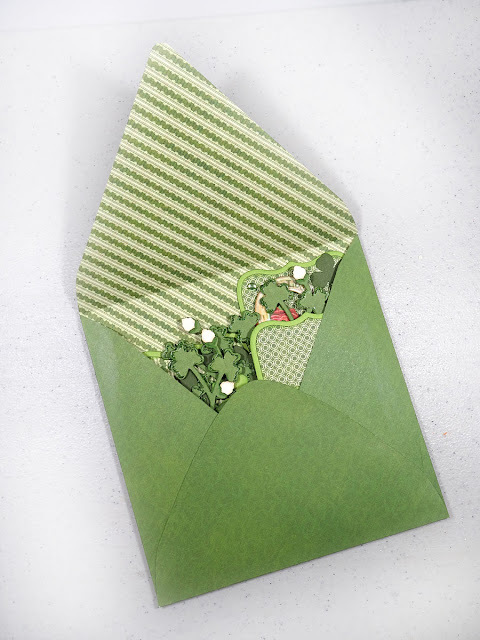 Oh, and by the way, the envelope is also included in that SVG file. 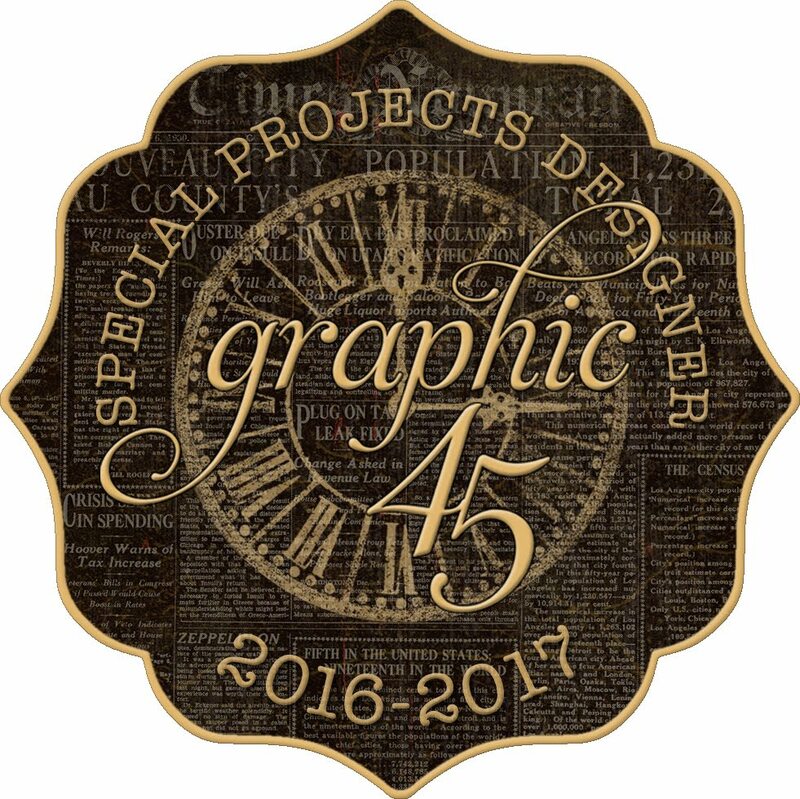 I can't wait to make some more of those great projects in that bundle. Stay tuned because some of those are perfect for Springtime crafts and Easter projects. Meanwhile, have a great weekend, and as always, thanks for stopping in today. We're already into March of 2017 and it's gonna be a busy and fun-filled remaining 9 months. Already I've been to Creativation in Phoenix in January, and taught two classes at one of my favorite Florida scrapbook stores Scraporium in February. I'm teaching here at my home in March, then it's off to visit possibly YOU at your local scrapbook store. Check out my schedule below to see if I'll be in your area this year. Details and photos of each location's classes are posted in my Calendar tab above. Contact the stores directly to sign up or get more information. Don't see a store near you? Let your local store owner know you'd like to have me teach there in 2018!